I found myself the other day scrambling around the kitchen trying to find something quick to cook for dinner. I grabbed a bag of chicken wings and decided to try something a little different. Since they are the IQF type they were easy to thaw out. I then washed them up and patted them as dry as I could. I seasoned them lightly and heated up the fryer (this is my first of 3 times a year that I actually fry!) I dropped those suckers in (no breading) and fried them up til they were crispy and brown. I wanted to take these plain wings to another level so I searched around the fridge to see what I could come up with. Is this a familiar image to you? 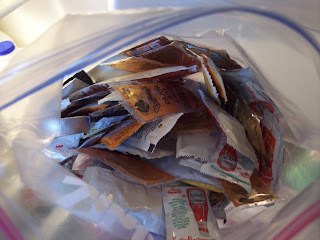 The bag of condiments that you keep and think you will use some day. Well I was lucky enough to find about 5 Chick-fil-a sauce cups (2 varieties) and I had a little Sweet Baby Ray's Chipotle Honey barbeque sauce. **I can just hear Dwayne screaming about the need for endorsement money lol! ** I just mixed the 3 different sauces together and drizzled it over the freshly fried wings. Instant magic. My family went on and on about how it was the best chicken they have ever had. And I witnessed a couple of them licking the plate (don't try to act like it didn't happen, you know who you are!) They loved it so much you would have thought that they had steak and lobster! No matter how much the cook of the house can feel like they need to go the extra mile to make more interesting meals, it comes down to one thing. KEEP IT SIMPLE. How many of you find that when you make a frugal meal or a quick, thrown together meal that your family seems to prefer that over something really fancy? Sounds like a wonderful meal. It always amuses mewhen they lick the plates. Keeping it simple sounds like it was a sure fire hit! That is the best!!! I have a baggie like that, too! Now I know what to do with it! How funny that the simplest things can be the most delicious! That sound like it was really good. I have been known to throw together some things in a hurry to get dinner done. Yeah, the boys love it simple... no take out. Just quick and easy. Let me know when you're cooking some more of those. Sweet Baby Chick-Fil-A Wings (You can use that if you want to).